The financial crisis is just beginning for retail institutions. Ninety to ninety-five per cent of bank transactions are executed electronically today. The Internet, ATMs, call centres and smartphones have become mainstream for customers. But banks still classify these as alternative channels and maintain an organisation structure where Branch dominates thinking. 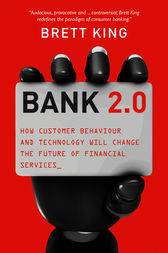 Continued technology innovations, Web 2.0, social networking, app phones and mobility are also stretching traditional banking models to the limit.